An Israeli airstrike against an Iranian weapons cache in Syria last night has ended with the downing of a Russian military plane and the death of its 15 crew members. Why it matters: The incident has created the most serious crisis between Israel and Russia since President Putin sent his army to Syria in September 2015. Israeli officials are concerned the incident will break the close coordination with the Russians in Syria and limit Israel's freedom of operation against Iranian entrenchment in the country. The big picture: In the last three years, Israel and Russia have built an effective coordination mechanism in Syria to ensure deconfliction between both countries' militaries. In those three years, Israeli Prime Minister Benjamin Netanyahu and Russian President Vladimir Putin have also built a very close relationship and reached several sets of understandings regarding Syria. What we're hearing: Israel's main concern in Syria was Iranian military entrenchment that would give the Iranians a base for attacks against the country. Israeli officials told me Netanyahu describes the understandings with the Russians by saying that, "As long as we don't topple the Assad regime and as long as we don’t hit Russian soldiers, Putin doesn't have a problem with what we do in Syria." According to those understandings, Israel fired off more than 200 airstrikes in Syria in the last three years with the Russians almost always looking the other way. Meanwhile, relations between Putin and Netanyahu only grew stronger. What happened last night: Israeli jets attacked a warehouse in a Syrian military base in the coastal city of Latakia. According to the Israeli army, the warehouse was used to manufacture precision missiles that were about to be transferred on behalf of Iran to Hezbollah in Lebanon. After the airstrike, the Syrian air defenses fired several missiles against the Israeli jets. The Israeli army says the Syrian missile fire was inaccurate, indiscriminate and done without checking if there were Russian aircraft in the area. That ended in the downing of the Russian reconnaissance plane. The Israeli army also said that when the Syrians fired their missiles, the Israeli jets were already in Israeli airspace and the Russian plane was not even in the area of operations. The fallout: The Russians were furious and claimed Israel "deliberately created a dangerous situation" for their plane. The Russian ministry of defense admitted that the plane was hit by a Syrian missile but blamed Israel for giving them only one minute of prior warning — thus violating their deconfliction agreement. The Russian minister of defense called his Israeli counterpart, stated that Israel was responsible for the incident and said Russia reserves the right to take retaliatory action. The Russian Foreign Ministry also summoned the Israeli deputy ambassador in Moscow. Russian Deputy Foreign Minister Sergey Vershinin told the Israeli diplomat that his country's actions were "irresponsible and unfriendly." Israel issued several statements expressing regret for the death of the 15 crew members, but emphasized that Syria and Iran were responsible. State of play: The Kremlin and the Israeli Prime minister's office have tried to de-escalate the crisis. Putin said in a press conference that Israel didn't shoot down the plane, and he added that it was a result of "a chain of tragic circumstances." Later, Putin and Netanyahu spoke on the phone. Netanyahu expressed regret for what happened and promised Putin that he'd send the commander of the Israeli air force to Moscow to give the Russians a brief on the incident. Putin told Netanyahu that the deconfliction understanding was not observed by Israel, and he warned Netanyahu to ensure it doesn't happen again. President Trump spoke about the incident at a press conference with his Polish counterpart and said Syria was the one who shot down the Russian plane. Secretary of State Mike Pompeo also issued a statement, putting the blame on Syria and on "Iran’s provocative transit of dangerous weapon systems through Syria, which are a threat to the region." What's next: Putin said today that Russia will retaliate by creating more security for Russian troops and bases in Syria. Putin added, "It will be steps that everyone will notice." It is not clear what Putin meant, but Israeli experts and analysts think the Russians might boost their anti-aircraft capabilities in Syria and maybe even give the Syrian army air defense systems they didn't initially offer so as to not anger Israel. Israeli officials fear any such Russian action could limit the freedom of operation Israel had in Syria over the last three years. 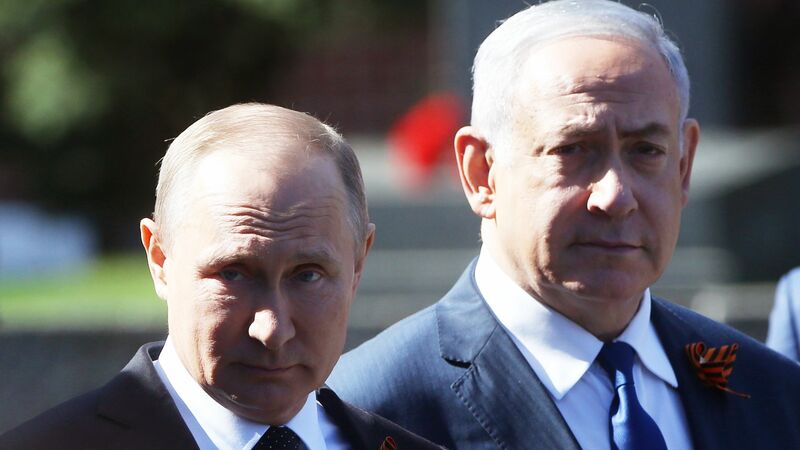 Political leadership in Russia and Israel is working to contain the crisis and maintain the close coordination, but this incident puts the Putin-Netanyahu relationship under their biggest test yet.